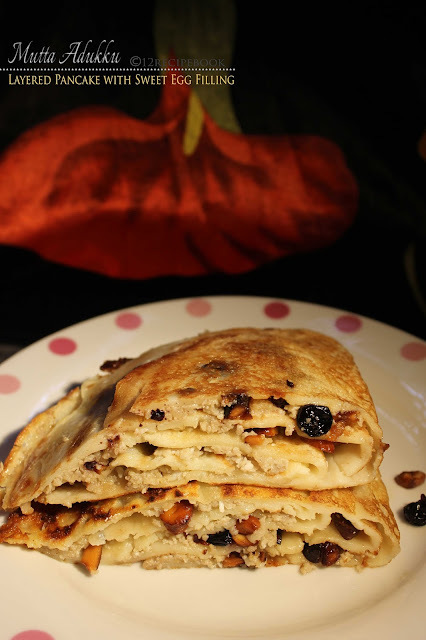 Mutta Adukku (Layered Pancake with Sweet Egg Filling) is a Malabar (area of Southern India) special ifthar snack. The pan cake crepes are filled with sweet egg filling makes the dish rich and delicious. You can try it with spicy filling also. Fry the cashews and raisins in 1 tbsp of ghee.Take it out and keep aside. In the same pan add thick milk, sugar and 3 eggs; mix well stir cook for few minutes until thickens and scrambled. Switch off the flame when it's completely dried. keep aside to cool. In a large bowl; mix the ingredients for the batter. (Flour, salt, sugar, 2 eggs). Add water little by little and make a smooth flowing batter. (milk like consistency batter; almost 1 1/2 cups of water). Now heat a non-stick pan or cast iron skillet with a teaspoon of ghee. 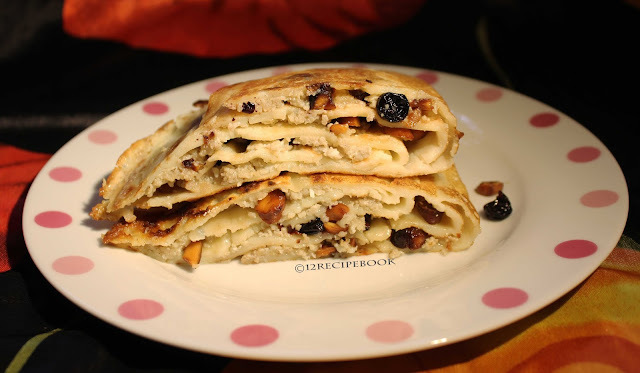 On the one half of the crepe; quickly spread the filling ingredients evenly. (a part of scrambled egg mix, poppy seeds, fried nuts and raisins). Fold the crepe from one end to other and tap the edges by pressing well with the ladle. In the remaining empty one half side add another half ladle of batter (by touching the first crepe). Apply the fillings evenly on the half (before the crepe gets cooked) side. Now fold the first folded layer above this layer (so that the new layer in the bottom and first layer in the top. Repeat pouring the batter on the empty side and apply filling quickly and fold the first created layers above it until the batter gets finished (You can make 4-6 layers of pancake and divide the filling according to the layers evenly). Switch off the flame after done all the layering and allow to cool little. Carefully add to a serving plate and cut it with a sharp knife in to small pieces and enjoy!